Who remembers the days when neighbours would pop over unannounced for a cup of tea or the next-door neighbour would put their head over the fence to ask if they could borrow a cup of sugar? It used to be a very common occurrence but nowadays, people don’t seem to have time for their neighbours or just aren’t interested in getting to know them. A recent survey found that 17 per cent of Australians don’t even know the names of their nearest neighbours. While the social fabric of society may have changed, children and young people feel safer when they know the people in their local community. They feel good when the neighbours and local shopkeepers smile and say ‘hi’. It fosters a friendly and trusting environment where they know they know there are people around to turn to in an emergency – even if they don’t know them personally. With this in mind, Neighbour Day 2018 is an ideal opportunity for people to reconnect with their local community. While there are many ways to get involved, such as holding a morning tea or street party, you can start by simply being more present in your local area. Here are a few simple things you can do to better acquaint yourself with your neighbours and your local precinct. Start with a smile. A simple smile and hello to the people you pass in your neighbourhood, including children and teenagers is an easy way to get to know people you don’t know, or only know by sight. Build relationships with people by asking them questions. For instance, how long they have lived in the area or recommendations for local trades and services. They can be a good source of knowledge, particularly if you’re new to the neighbourhood. Take regular walks to get to know the streets around your home, making sure to take a different route from time to time. If you’re walking the dog, you’ll often end up stopping to chat to fellow dog owners. The local dog park can also be a great place for both dogs and people to socialise. Make an effort to introduce yourself whenever new people move into the street. Delivering a batch of home cooking is a sure-fire way to build trust and make people feel welcome. Sign up to your local community’s Facebook group. Many suburbs have a community page where you can promote local events and exchange advice on local services. Join the local gym or sporting team. If you’re a bit shy around the neighbours, a sporting team can be a great way to foster new friendships with the locals in a fun and relaxed environment while getting fit at the same time. Remember that the benefits of getting on with the neighbours can also mean you have extra support when you’re going away on holiday and need someone to keep an eye on your house, feed your pets or even collect your mail. 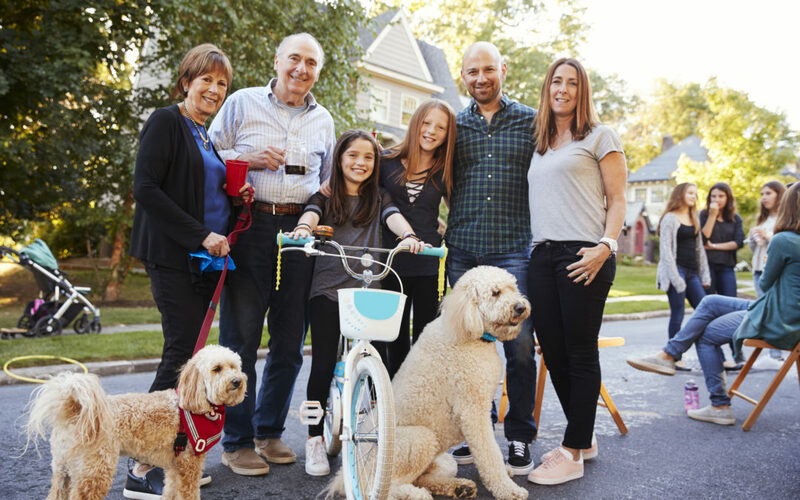 While Neighbour Day is only an annual event, falling on the last Sunday of March, it serves as a timely reminder about the importance of community and that personal connections can make a difference every day of the year.